As a US Marine, Scott Olsen lived through “blood, sweat and tears.” Twice. After two tours of duty in Iraq, first from 2006 to 2007, then again from 2008 to 2009, he finally came home to Wisconsin. He then moved to the Golden State, rented a house with a friend and got a job as a systems network administrator in Daly City, just south of San Francisco. But on the night of October 25, Olsen, who had survived enemy fire as a member of the 3rd Battalion, 4th Marine regiment in Iraq, was hit by a projectile shot by a law enforcement officer as he joined a few hundred people protesting with Occupy Oakland that night. He was hospitalized for a skull fracture and brain swelling. Veterans have long been involved in American social movements and protests—particularly anti-war ones. Take, for example, the protests, demonstrations and acts of civil disobedience organized, in the early 1970s, by the Vietnam Veterans Against the War. But veterans’ involvement in the Occupy movement went largely unnoticed by organizers and protesters alike until October 15, when a video of Marine Sergeant Shamar Thomas went viral on the web. In the video, Thomas spontaneously addresses NYPD officers patrolling an Occupy Wall Street demonstration, passionately criticizing their crowd-control methods and brutality. Similarly, other organizations such as Iraq Veterans Against the War (IVAW) and Veterans for Peace (VFP) have been supporting the movement by occupying Zuccotti Park. “Joining the protest is the opportunity to show visible support for what probably is the most important American social movement of this generation,” says Joseph Carter, a media spokesperson for IVAW who has taken part in the protest at Freedom Plaza. It is not difficult to see why veterans are particularly suited to align themselves with the Occupy movement. While the financial crisis has affected the vast majority of Americans, veterans have been particularly burdened. Foreclosure rates in military towns, for example, were growing at four times the national average in early 2008, as military families were particularly targeted by subprime mortgages’ lenders. The recession, along with the difficulty of reintegrating into society, have resulted in particularly high unemployment rates for recent veterans. Overall, 11.7 percent of soldiers that fought in Iraq and Afghanistan are currently unemployed, compared to the 8.6 percent of their civilian counterparts. For veterans between 18 and 24, the unemployment figures are worse: 20.9 percent as opposed to the 17.3 percent of non-veterans of the same age. Wounded vets oftentimes have it even harder. Finding a job is difficult for everyone these days, says Carter of IVAW, “but the trauma that veterans have had during deployment play a crucial role in making it particularly difficult to reintegrate [in civilian life].” Carter points to the alarmingly high incidence of Post Traumatic Stress Disorder (PTSD) among Operation Enduring and Iraqi Freedom (OEF/OIF) veterans as an obstacle to finding employment—29 percent of all OEF/OIF veterans currently being treated by the Department of Veteran Affairs are being treated for PTSD. This figure is nearly double that of the incidence of PTSD in Vietnam War veterans (15.2 percent), and more than twice the rate of PTSD in Gulf War veterans (12.1 percent). Military Sexual Trauma (MST), that is, sexual assault or sustained sexual harassment, feeds in to the problem of PTSD. Studies from the San Francisco VA Medical Center have demonstrated a connection between MST and the development of PTSD, particularly in female veterans, as recent projections estimate that one in three female service members experiences MST during her service in the US military. Employers often do not have a clear understanding of what PTSD entails—serious headaches, temporary memory loss, poor concentration, garbled speech, dizziness and anxiety in a crowd. In fact, many employers fear that veterans suffering with PTSD pose a safety threat to other workers and would require costly accommodations for their condition. According to a 2010 survey of the Society for Human Resource Management, 46 percent of the questioned employers believed that PTSD and other mental health issues posed a hiring challenge. However, only 22 percent of the respondents thought the same about combat-related physical disabilities. In addition to this, wounded veterans also had to navigate the slow and often cumbersome path towards medical care and disability compensations—according to a 2010 Iraq and Afghanistan Veterans of America (IAVA) report, wounded veterans without the representation of lawyers or service organizations received “less than half the compensation” awarded to those who had such assistance. 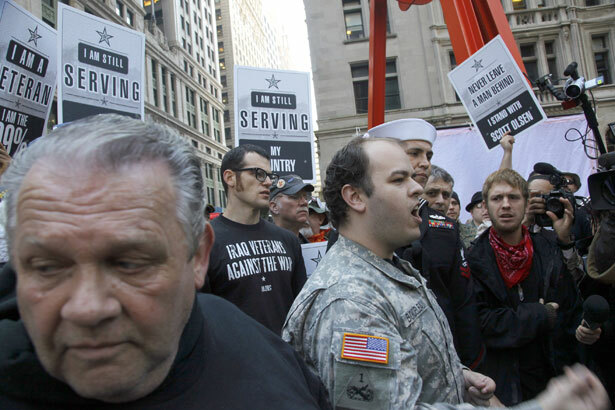 As veterans and civilians alike attended a solidarity vigil in support of Scott Olsen on October 27, in New York as well as in other cities across the nation, Ed Mullins, head of the NYPD sergeant union, penned an op-ed in the New York Post in which he warned OWS protesters that he would pursue legal action against anyone who harms police. There was no mention of police brutality. With IVAW, VFP, Occupy Marines and other veteran organizations pledging their support for Occupy Wall Street, the movement continues to grow and gain legitimacy. The (peaceful) fight goes on. Paolo CraveroPaolo M.C. Cravero is a Nation intern and a freelance journalist who holds a Master's in International Affairs from The Graduate Institute, Geneva. His Twitter handle is @PaoloCravero.